Katherine Frankstone quickly rolled up the windows of her Prius as the South Carolina summer heat gave way to the first thunderstorm of the day. She takes a swig of coffee as “It’s a Wonderful World” comes on the radio and her mind starts to wander towards the upcoming weekend when her three fully-grown sons will be coming into town to visit. As she eases her car to a stop in front of the Grey Ghost Bakery, she can’t help but smile. Putting the car in park, she downs the rest of her coffee then grabs the tupperware full of test cookies sitting on the passenger seat. She tucks it under her jacket and hurries toward the front door as the rain continues to pour. As soon as she is inside, she’s enveloped in a sweet scent of Molasses Spice — her award-winning, top-selling cookie. 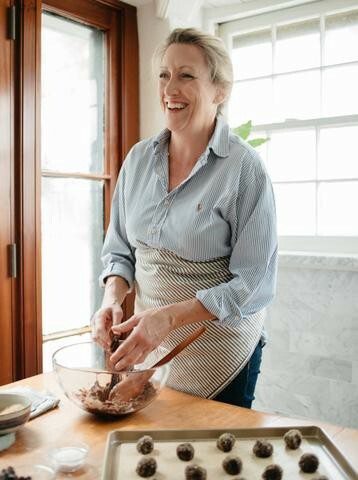 As owner and chief baker of Grey Ghost Bakery, Katherine has always had a love for baking. When she was six, she asked for an Easy Bake Oven. “My parents — who were a bit on the serious side — thought that if I was expressing an interest in learning how to bake, that I needed to do it in the real thing,” shared Katherine. Her parents dragged her from the toy store and into the warmth of their family’s kitchen where she learned to bake, perched on a stool next to her father. 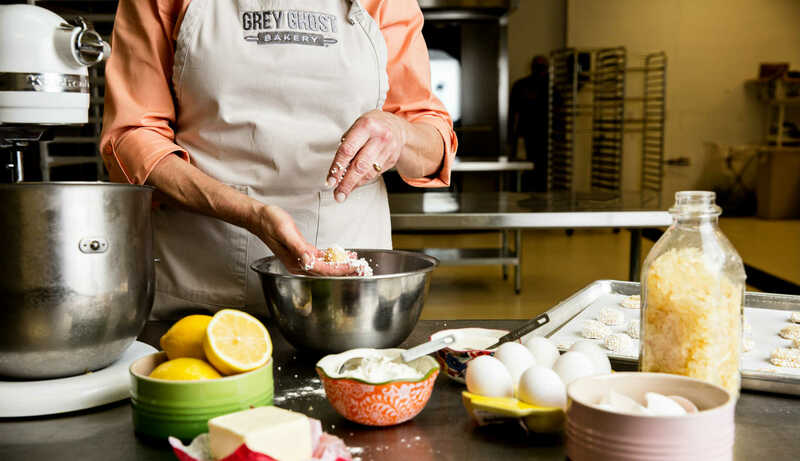 It turns out, Katherine was always destined for the “real thing.” Today, Grey Ghost Bakery products are sold in more than 200 retail locations, such as Whole Foods and other specialty grocers, across 34 states. The bakery also has a growing direct-to-consumer web business. Sitting around a table in the back room, for a second you think you’re at Katherine’s dining table, with an assortment of cookies laid out in front of you. 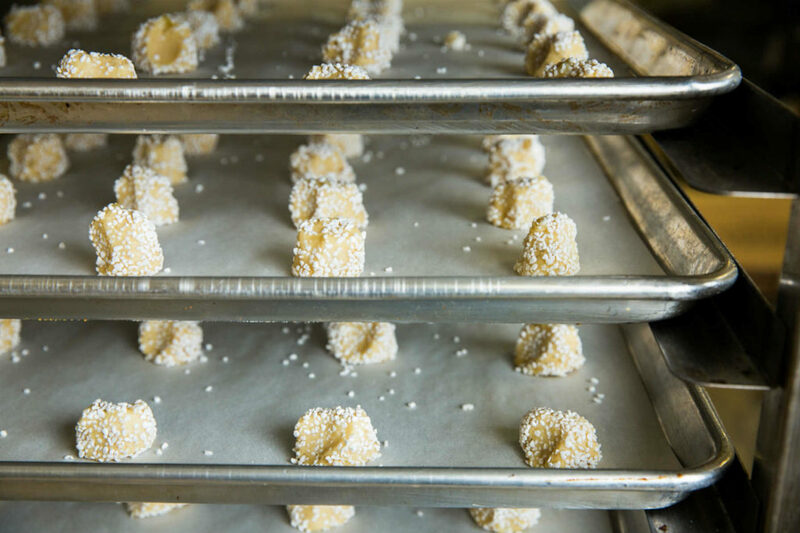 She treats you and all of her employees like family as she passes around batch after batch of delicious baked goods. Her eyes light up as she talks about bringing Grey Ghost Bakery to life — surprising since not everything was always fully-baked along the way. Even after months of research, she wasn’t confident that she could get things off the ground. During the holiday season of 2011, she had committed to donating her cookies to a fundraiser, with the intention of quietly folding her business afterwards. After the holiday fundraiser, however, word of Katherine’s cookies spread faster than the centuries-old neighborhood folklore of the Grey Ghost — the namesake of Katherine’s bakery. By Christmas of that year, Katherine had received orders for over 300 bags of cookies. “Perhaps I have something here that didn’t need to be buried.” Fast forward to today, Grey Ghost Bakery is far from dead. 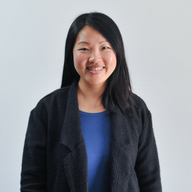 Today, Katherine spends her time overseeing business and product development for Grey Ghost Bakery. She loves spreading the word about her bakery, with the help of 18 team members across marketing, production, warehousing, packaging, and shipping. 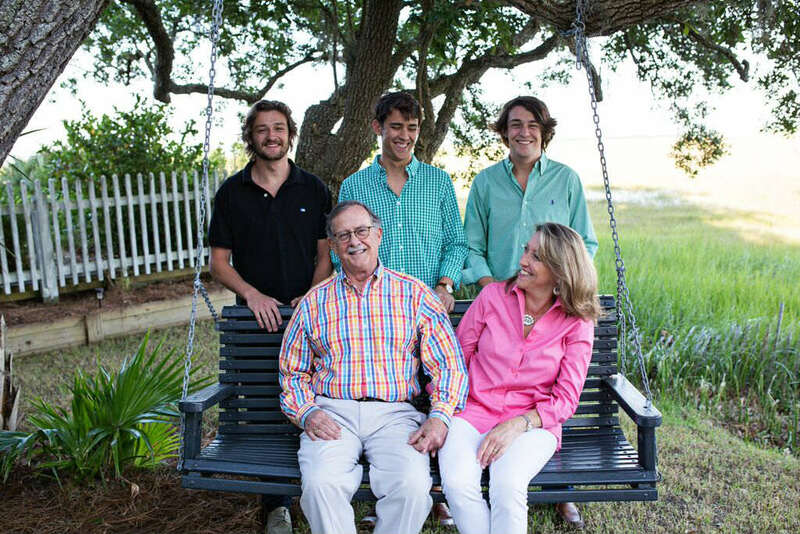 After parenting three boys plus all the neighborhood kids, Katherine’s care and concern for her customers extends far beyond tickling their taste buds. What keeps her up at night, besides a friendly ghost? Food safety and compliance in the industry. As you bite into one of Katherine’s infamous, carefully-crafted cookies, you think Katherine might just be on to something — especially her not-so-secret ingredient: love.